"People have said through the ages that without sacrifice there could no be victory. These are rough times. Do we have the courage to overcome every hurdle on the way? This is the chance to become a hero," says in Spanish Nicaraguan slugger Felix Alvarado's own homemade 4-minute video in Español aiming at motivating himself ahead of his important battle against Filipino Randy Petalcorin (29-2-1, 22 KO's) for the IBF 108 World Title this coming Monday in Manila, Philippines. 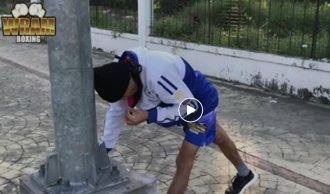 The short video posted by Alvarado in his Facebook account shows scenes of the power-puncher Nicaraguan while training, running and exercising around A. Mabini Street in Malate, Metro Manila, not far from the Bangko Central Ng Pilipinas. The end of the video shows Alvarado looking strong while knocking out his latest opponent, unheralded Mexican Ivan Flores (19-18-1, 11 KO's) last April in Managua. A slugger by nature, Alvarado (33-2, 29 KO's) earned the right to fight for the IBF 108 world title. In October of last year, Alvarado, 29, ravaged in two rounds world-ranked warrior Teeraphong Utaida (37-6-1, 21 KO's) of Thailand to win the IBF world title eliminator. The referee for the Alvarado-Utaida battle was American Ernie Sharif of Pittsburgh, Pennsylvania, the same third man scheduled for Alvarado's clash against Petalcorin. Carlos Costa is a veteran man of boxing living in Cebu, Philippines. He can be reached by email: Carlos512@hotmail.com and Whatsapp +639184538152.